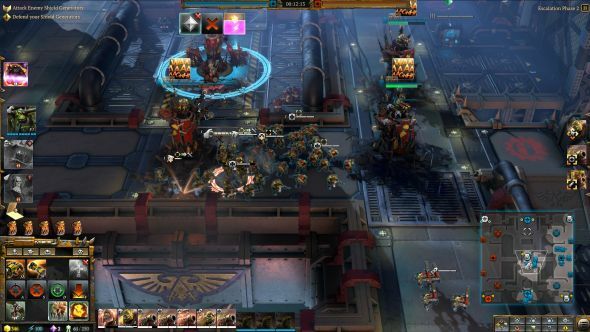 The worry, for both fans of Dawn of War and those wanting to see RTS step forward, was that the third game in Warhammer 40,000’s best series would look to emulate the successes of the genre. StarCraft II (primarily) pulled the genre into this decade, but its particular brand of micro-heavy resource management and massed armies isn’t very 40k. 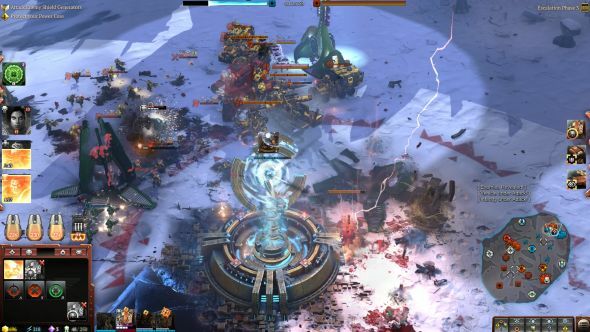 Thankfully, Dawn of War III avoids that pitfall and creates its own niche of humongous units, enough squads and vehicles to fill a screen and beautiful battles. It’s happily avoiding any attempt to be the perfect, competitive multiplayer game, instead focusing on fun and spectacle and hoping it works out in the end. That, then, is the question. 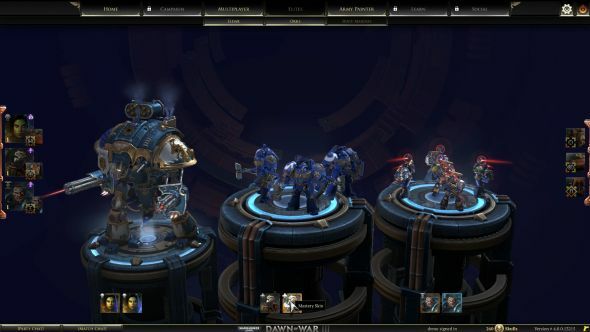 For a look at what you’ll be playing with, have a check of our Dawn of War III unit guide. The elite units really are the focus. They’re not getting whole previews to themselves for nothing, and outside of which faction you choose to play these will define your battles. For the uninitiated, elites are chosen pre-battle and are the best of the best available for your army. You’ll pick three from a pool, and each has a cost to be deployed. These ‘elite points’ are generated by certain control points on maps, same as the requisition and energy needed to construct your buildings and line units, only at a much slower rate. Therefore, you need to either plan around staying alive long enough to deploy the big guns at the eight to ten range, or have a wide spread of possibilities to bring down at key moments. Game designer Caro Mastretta points out that this is a viable strategy, but involves good play from you and careful balancing from them. “Early game elites are important and they play many different roles, there are some games in which you’re going to struggle if you’re facing early elite opponents. But the thing is we’ve purposefully kept the elite resource separate from your army – your requisition, your power, your map control are feeding into how much you can invest in your army. “If you’re putting the focus on building a large army and also upgrading them, those early game elites are powerful but [will lose to a well-managed force]. That’s what we’ve balanced for. When looking at elites, we [consider] how much we’re asking players to pay for them and what are the different encounters that could be occuring at that point. You deploy a three point elite, it’s likely that a Space Marine opponent might have three Tactical Squads at that point, we look at that encounter – how is it feasible, how is it overpowered for one side or the other. That elite selection is more than just a choice of early, mid and late game options, however. The newly announced system of doctrines changes the maths. 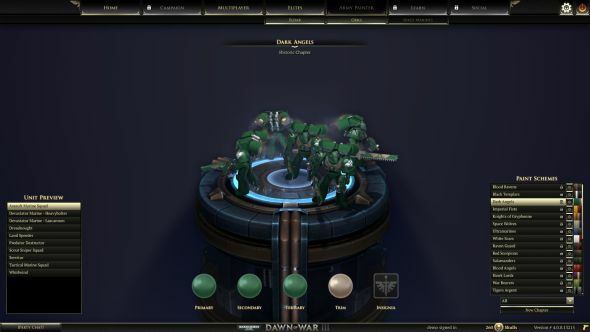 Doctrines are also selected pre-battle, and come in two flavours: one attached to each of your elites, and three more that are army wide. The army doctrines function permanently, while the others are in effect while their attached elite is in play. Most buff a single unit type. Be it making Space Marine Tactical Squads a tad more powerful in close combat, or increasing the ferocity of Howling Banshees. Some are more impactful, like Assault Terminators enabling your Dreadnoughts to charge across the battlefield and deliver powerful slams to enemy units and the poor, defenseless ground. In cases such as those it feels like a real choice you’ve made, and is all the better for it. They’re unique to each elite too, so it’s a deep, complex web of customisation that should prove a challenge to optimise. A progression system controls which doctrines you have access to on which elites, with XP gained whenever they take part in a battle. Level ups gift cosmetics, unit skins, new doctrines or unlock existing doctrines to be used as army ones without the need for that elite. This seemed extremely stingy in the build I played, with barely a fifth of a level gained from a full battle and then only if that unit was deployed – meaning it would be particularly difficult to level up your expensive Wraithknights, Morkanauts and Imperial Knights should this version go live. Presumably, the upcoming beta will be used to balance out this sort of thing, and I’d personally prefer to see only cosmetic upgrades rewarded through this system, no matter how the numbers work out. Mastretta explains the goals of the system: “The gameplay unlocks, people tend to think it’s a matter of power – that’s something that we wanted to very strongly move away from, elites do not ever get more powerful they just get more choices to how they can affect the substance of the army.” In a strategy game, that sort of flexibilityis power, of course, so this will be quite the balancing challenge for the folks at Relic. 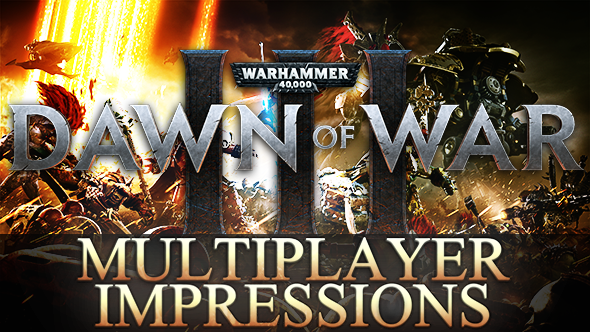 This all combines, along with an army painter as robust as you’d expect, to make your army feel like exactly that – yours. You’ve picked which super units to deploy, which troops will be good where and, presumably, have a plan to execute it. It’s satisfying too, countering early enemy squads with your cheaper elites, or producing early troops that can take control of the map to quickly summon in an elite that makes them even stronger. Once on the battlefield, elites look, feel and play as they should. They are not the be-all and end-all of whatever battle they happen to be in, but they’re the key advantage in an otherwise equal fight. As you head up the tech tree, they get more ridiculous, with the Eldar Wraithknight standing out as it alone covers up half the screen, leaping around with wanton disregard for the laws of gravity and the health bars of any enemy troops who happen to be in the way. In their pursuit of the “spectacle of battle” as Bouille coins it, Relic have succeeded masterfully with this highest tier of units. That, essentially, is what the team has been chasing in lieu of the eSport balancing act: bringing to new life the battlefields of the far future. 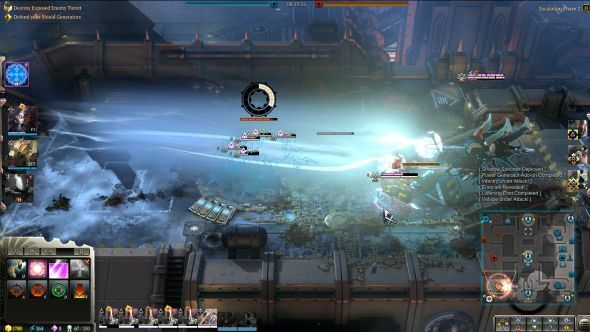 “What we were aiming for is to just make a really fun multiplayer experience,” explains Bouille, “to take some of the best elements of the games we built before, bring them into a modern space. Just deliver that sort of spectacle of battle that we built our reputation on. This feels most true in how simple the construction menus are for each race. You can easily play a full game creating just a handful of buildings out of the five or six available. Units are quite expensive, so spamming out a dozen production facilities just isn’t a viable economy. Once you’ve stacked listening posts on your control points to up their output, additional worker units are going to be surplus to requirements. This means most of your time will be spent keeping your army well positioned, ensuring you’re on top of upgrades, deciding broader strategy and engaging in combat. You know, the fun stuff, where the action actually happens and where all that effort has gone into making a readable, beautiful game. Any lingering complaints about Space Marines doing ballet or Lascannons not looking quite right falls away once it’s all under your control. Keeping all that in check was a challenge. 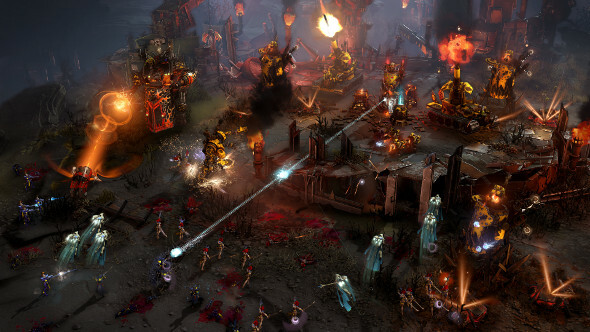 Sync kills for example, the special animations that played when units killed each other in close combat in the original Dawn of War, just didn’t fit into the plan. “Ultimately we built pillars of gameplay – presentation, action, executing your will, these were very important things for us,” says Bouille. “[With sync kills] we looked at it and went well the sync kill system doesn’t align with this. It’s not a vehicle of player agency, the effects and what’s happening under the hood don’t line up. So we went back to what we were trying to accomplish with them – that big, over the top satisfying sense of battle. We can’t do it as sync kills because that doesn’t create the game that we’re trying to deliver – how else can we do that? That has worked, and it’s certainly nice to look at and fun to play when you have that agency. However, that’s not always the case. Every game feels incredibly snowbally. The nature of resource generation being tied to capture points means that a bigger army leads to more resources, which means a bigger army. If a map is split, with one faction taking the middle point over another, it feels inevitable that they, eventually, will win. We played a mix of 2v2 and 1v1, and neither ever looked like the losing players had a chance after the ten minute mark. Once a small upper hand is gained, sitting back behind fortified listening posts until you have an overwhelming army seemed all too easy, particularly with the new cover system to give even hardier defenses to the dug-in. Upgrading resource points so they can’t be taken quickly is cheap too, so flanking maneuvers or back-line attacks aren’t effective before an enemy can move their blob of forces over to wherever you’ve decided to push. It’s a challenge faced by a lot of new players, as Mastretta explains. From there, taking smaller fights where you can use unit abilities, micro and advantaged damage types in your favour is the way to pull back into the game. Much of this, of course, will depend on specifics of map, army and just how far behind you are. 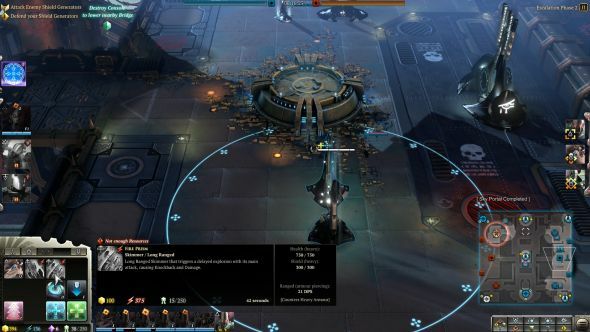 Mastretta gives the example of using anti-infantry Eldar Dire Avengers to fight against an army, with hit and run attacks to utilise regenerating shields and powerful grenade cooldowns. Clearly, a group of first-timers spending four hours throwing themselves at the game without so much as a tutorial isn’t going to produce the greatest balance testing ever, but it’s certainly a flaw to know the game is lost at 15 minutes and have to wait another 15 to actually see it happen. Relic have a number of options to alleviate this, the most notable is how they’re designing maps. They’re objective-based, rather than each simply requiring you wipe out all your opponent’s buildings or a single, central structure. The example we had was three lines of defence – power generators, turrets and finally a central core. Only one power generator needs to be destroyed to make the turrets vulnerable, which prove a formidable position to assault as they do serious damage. They and the core also have activated abilities – this all combines to be far more interesting to play than standard skirmish matches. It may be tougher to balance, though the inclusion of a map editor at launch puts that challenge in the community’s hands, but it is more fun. As has always been true, the best way to make an eSport is to not. Attempt new things, ensure it’s fun, make it beautiful and build a playerbase. 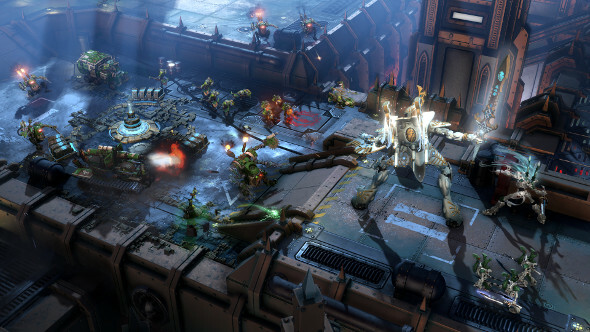 Dawn of War III can definitely do all those things, and it’s captured the spectacle of the impossible future-war that is 40k better than anything I’ve played before. The pure experimentation and exploration phase of being a new player is going to be much longer than you’d expect. Beyond that, and into the future, is up to Relic and the community.